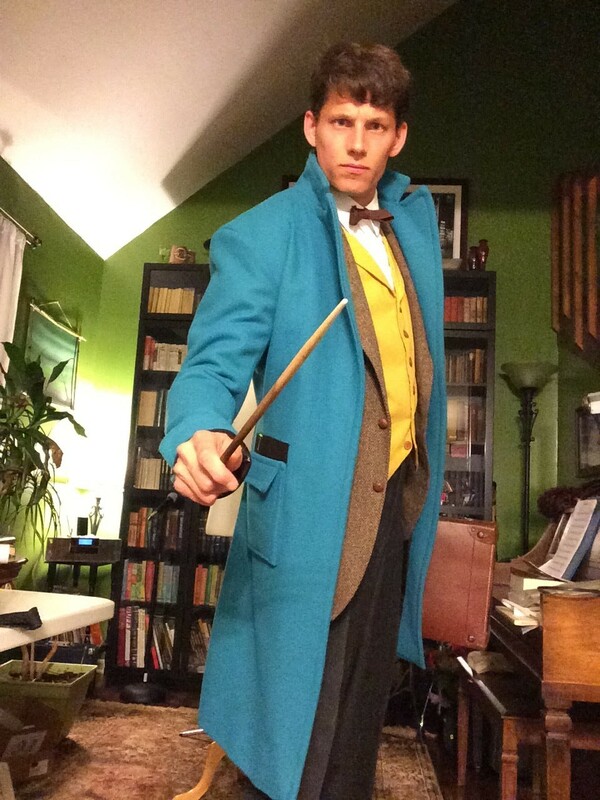 In November of 2015, while I was working on my Robin Hood costume, the first promo images for Fantastic Beasts and Where to Find Them came out. 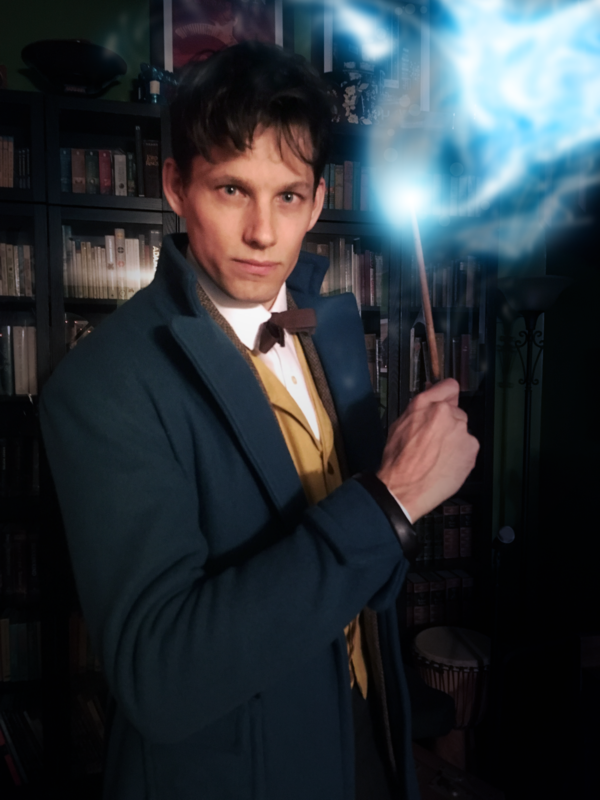 They feature Eddie Redmayne as Newt Scamander, a wizard specializing in magical creatures. I love the Harry Potter universe, but my only costume to date from that world is an old black graduation gown with a Gryffindor patch on it. 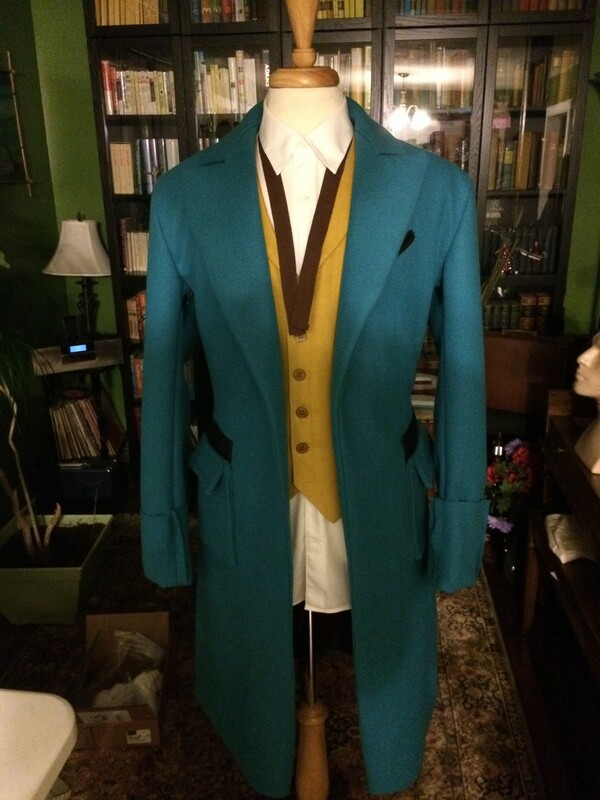 On top of that, Mr. Redmayne bears somewhat of a resemblance to me, so I quickly decided I wanted to make this costume. 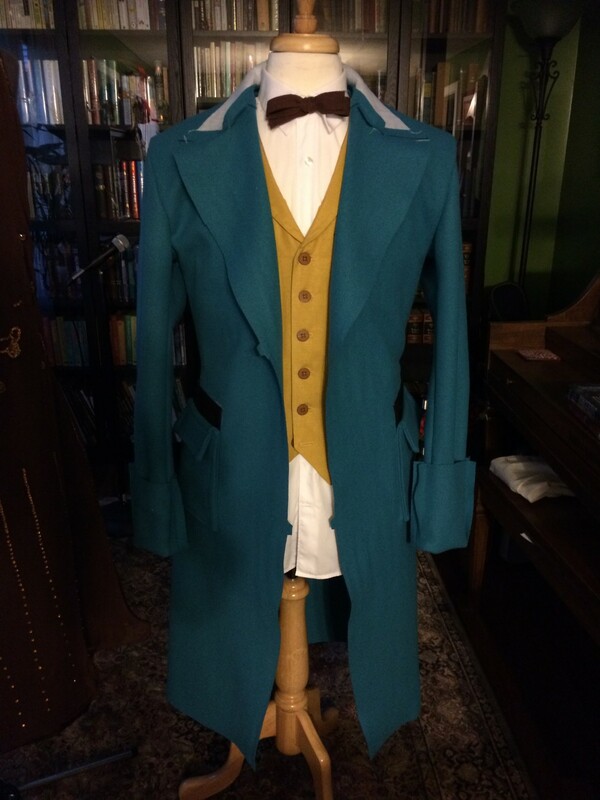 Luckily, I was already familiar with the basic construction of his frock coat because of its similarity to the 11th Doctor’s Christmas coat I made a couple years ago. 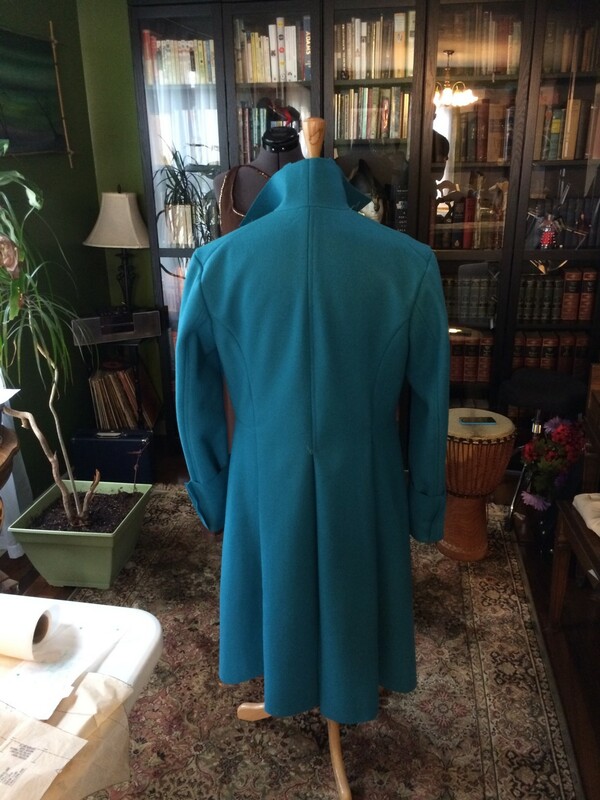 As with that coat, I started with Simplicity 2895. 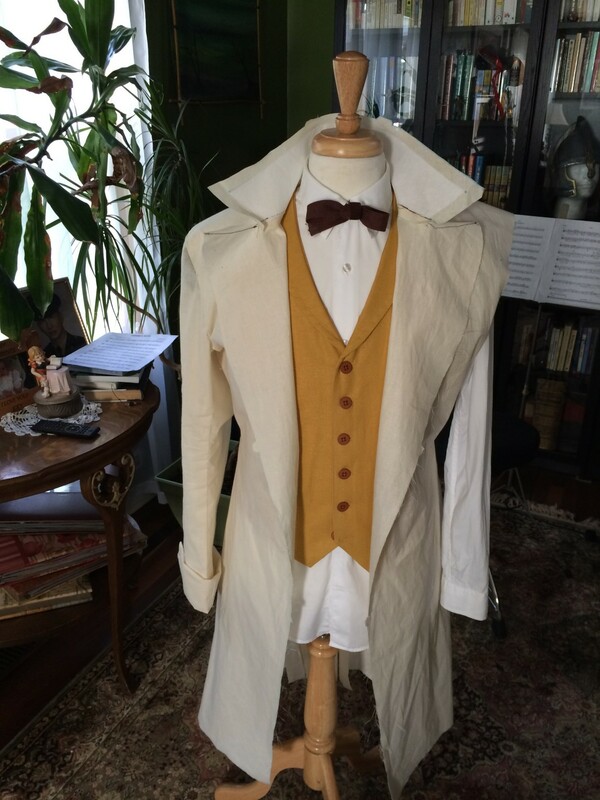 I knew there would be some alterations to both the waistcoat and frock coat, so I started by sewing a muslin mockup of the waistcoat to get a feel for how it fit, how the neckline/lapels would need to be altered, and to practice buttonholes. 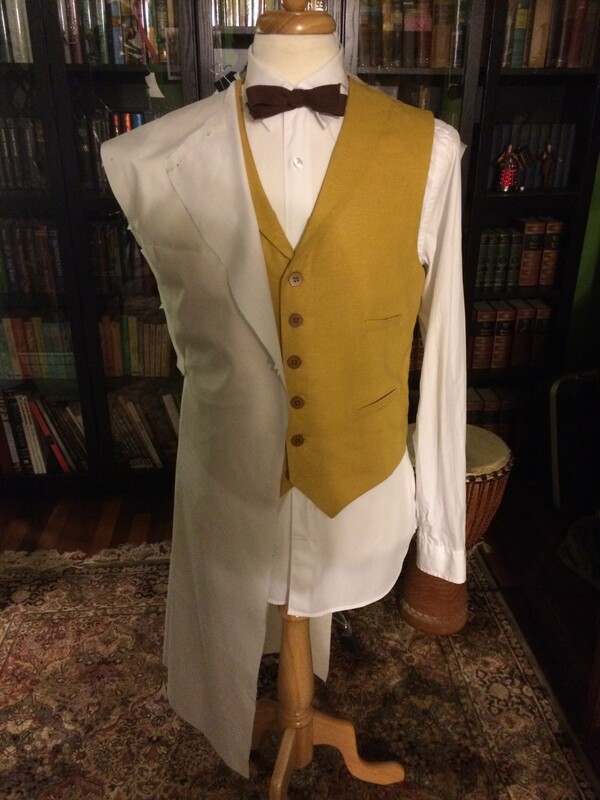 The mockup for the waistcoat showed me that I had to adjust the neckline to plunge deeper, and re-work the lapel shape to taper more to a point where it “rolls” into the front. 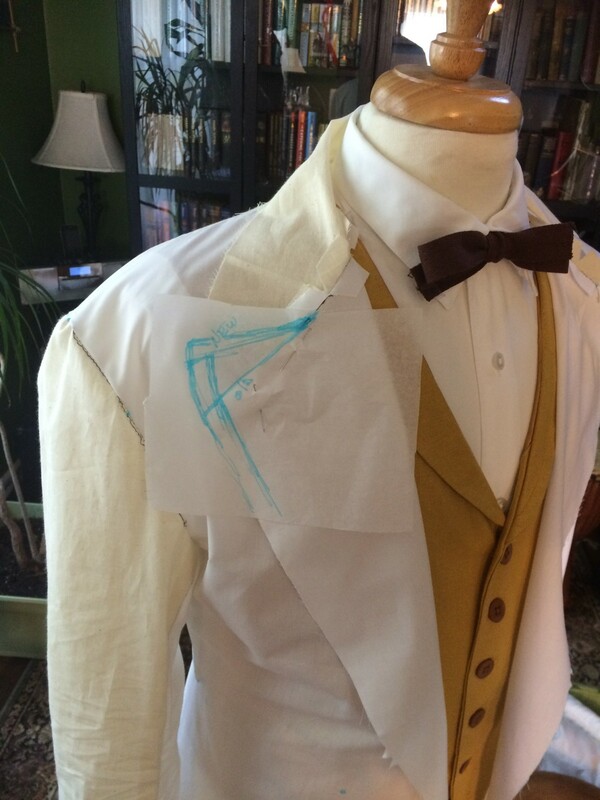 I know the construction of 2895 is different from the way Newt’s appears onscreen, where his seem to be a solid piece with a facing that continues from the body to the lapel like a suit coat. 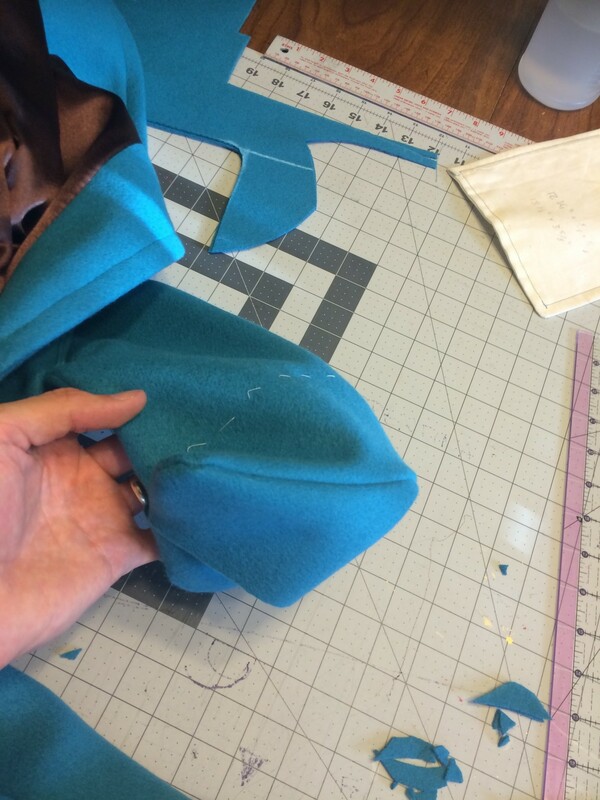 However, I was not confident enough to attempt to alter the pattern to that extent. 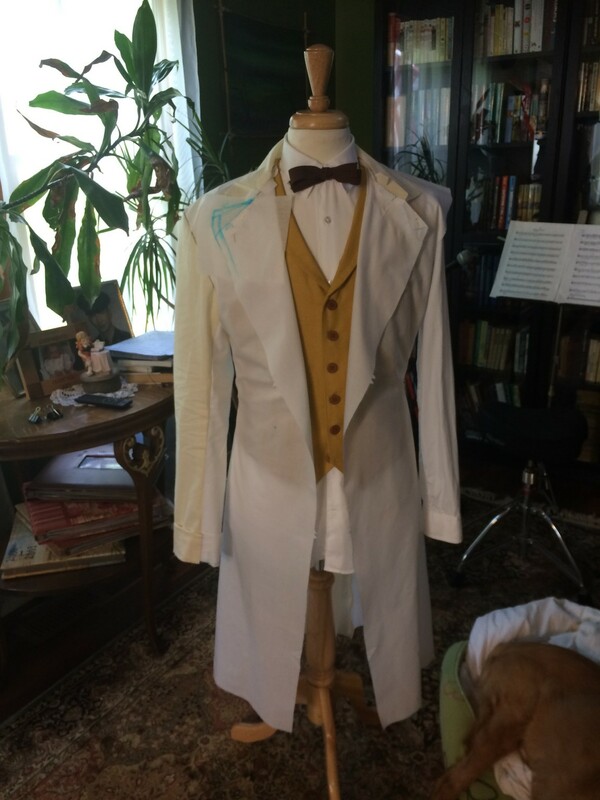 It still took some mental gymnastics and math, and I was thrilled when it went together better than I could have hoped – it even gives the appearance of having a roll to it! 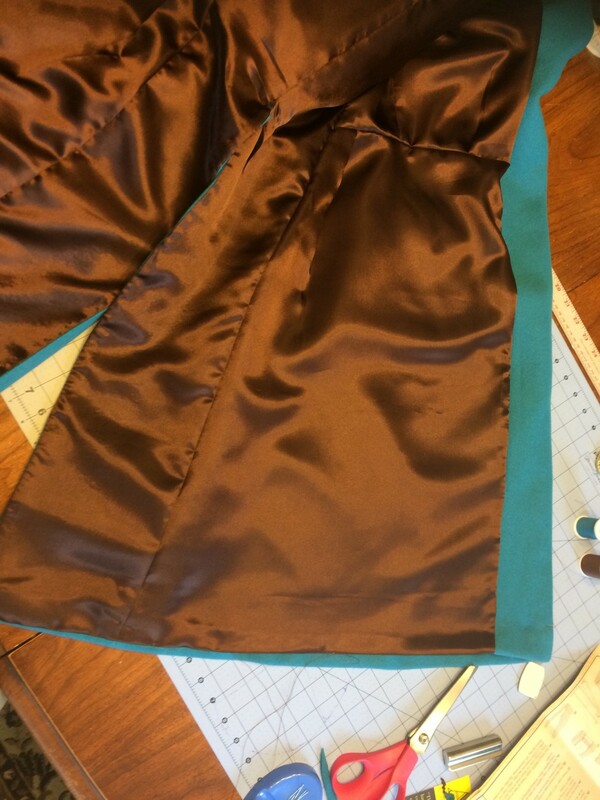 The fabric I ended up using is a lightweight gold linen from Jo-ann with a synthetic gold lining. 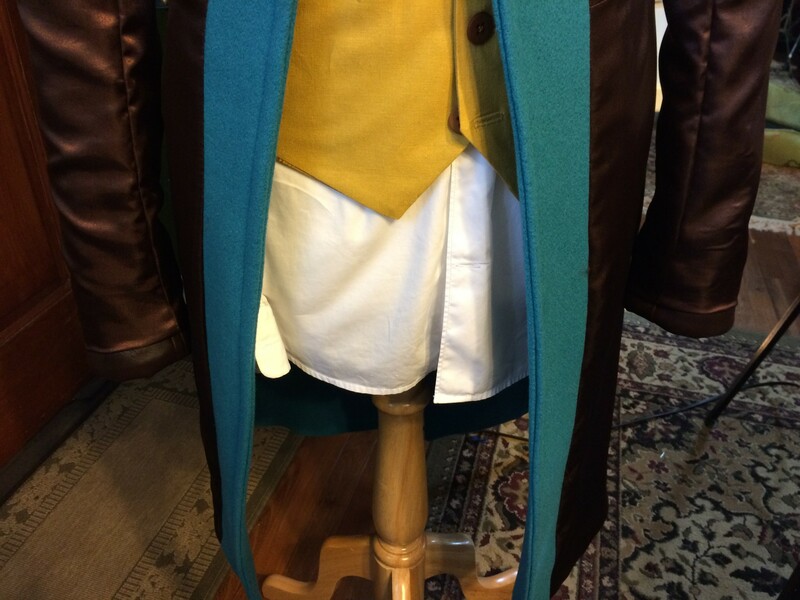 I actually got enough gold lining to also do the coat, but before I got to that point new images emerged clearly showing a chocolate brown lining. 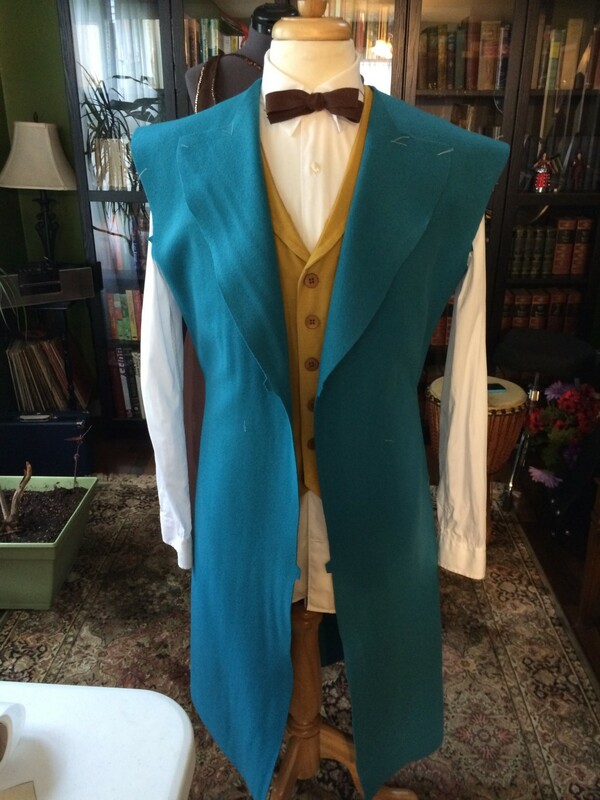 While working on the waistcoat, I got some wool swatches from periodfabric.com. 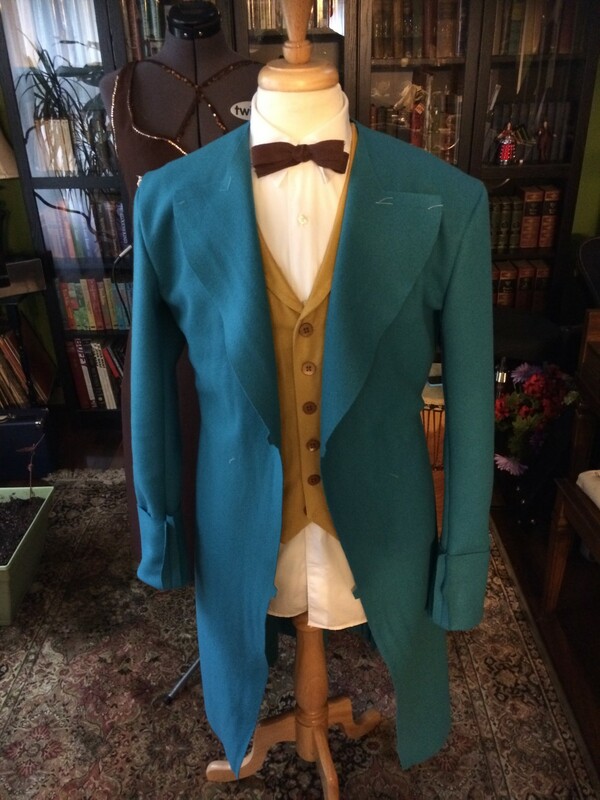 I was happy with the blue swatch labeled “WWH-229” so I ordered 3 yards – the minimum order, and also 1/4 yard more than the pattern recommends for the frock coat. 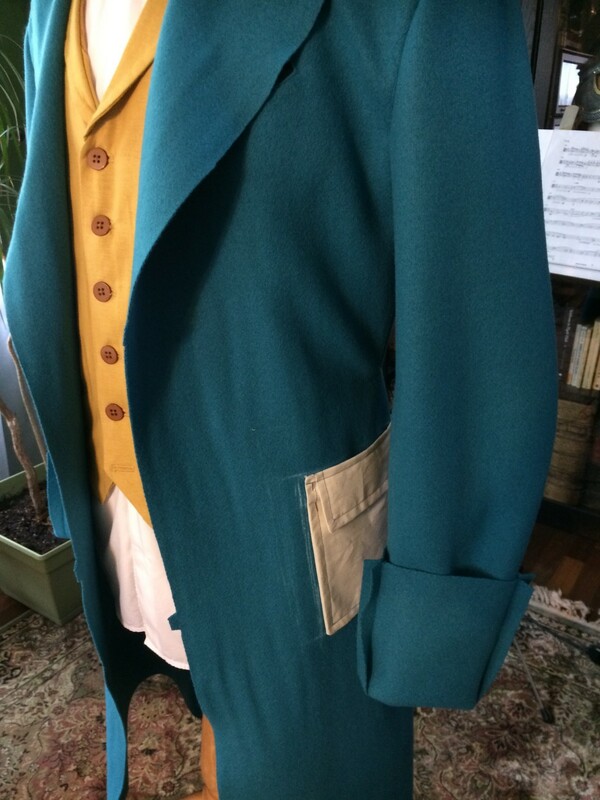 I figured that would be enough for the patch-pockets and cuffs which are not in the pattern (it was enough). I told them I preferred not to send back the swatch so they could ensure I got the exact same fabric. I was anxious to get started, and didn’t want to wait the extra few days. I ended up getting a slightly lighter color than the swatch. I probably could have dyed it darker, but I’ve never dyed wool before and I was nervous about ruining the color or texture. 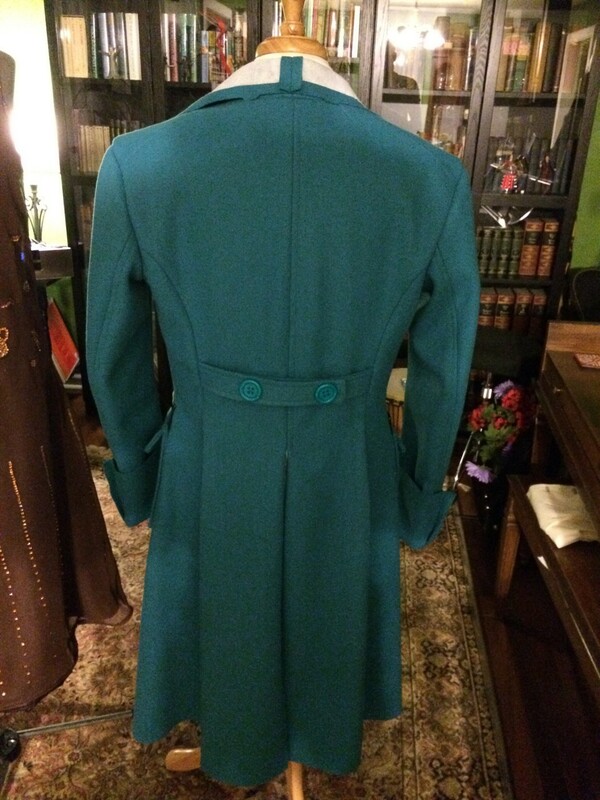 Anyway, the actual coat looks different in every single promo image, so I decided to be happy with it and proceed. 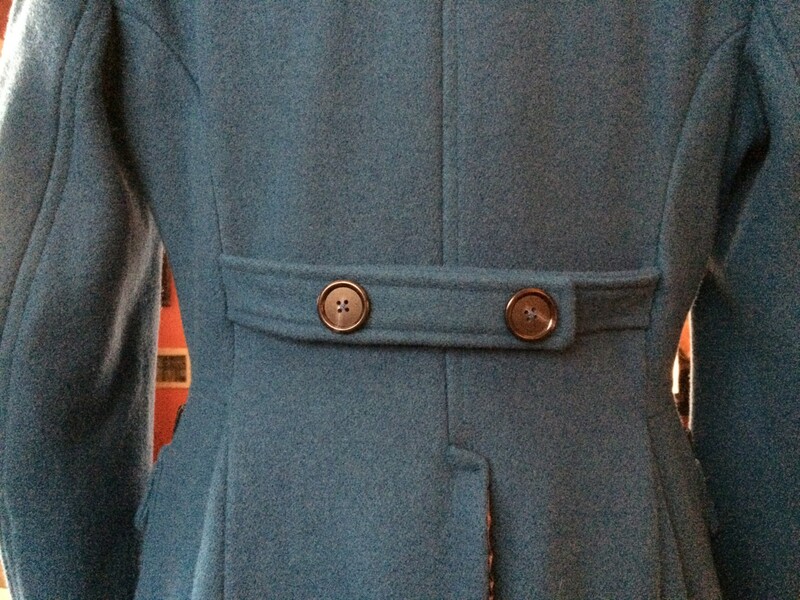 Belt in the back – two straps buttoned to each other. I tackled this in a couple of steps. 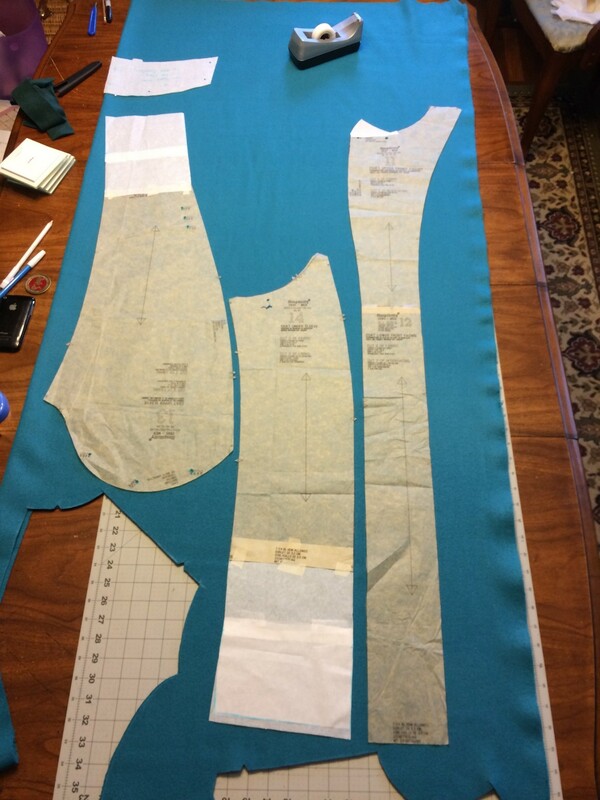 First, I combined the pattern pieces for the upper and lower front pieces and front facing, taking into account the narrowing at the waist due to the dart in the pattern. 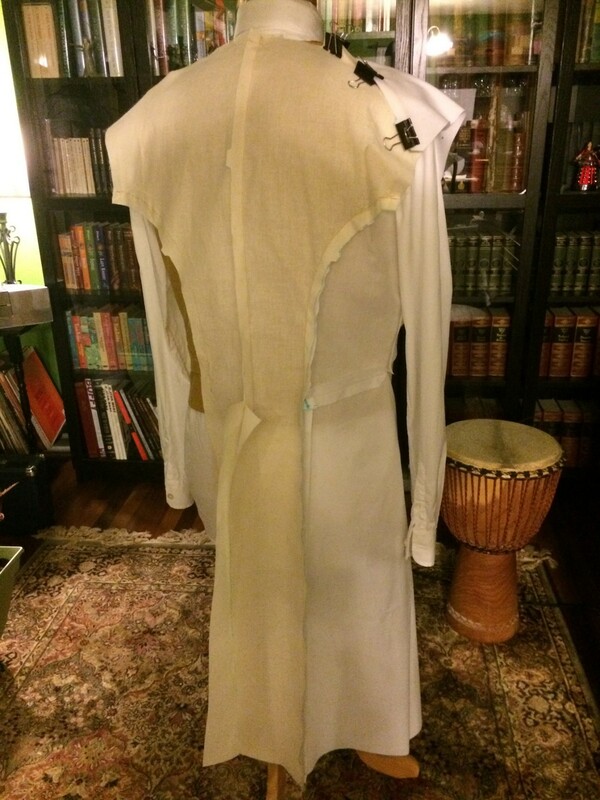 I was having trouble visualizing the other changes just staring at flat pattern pieces, so I made a muslin mockup. 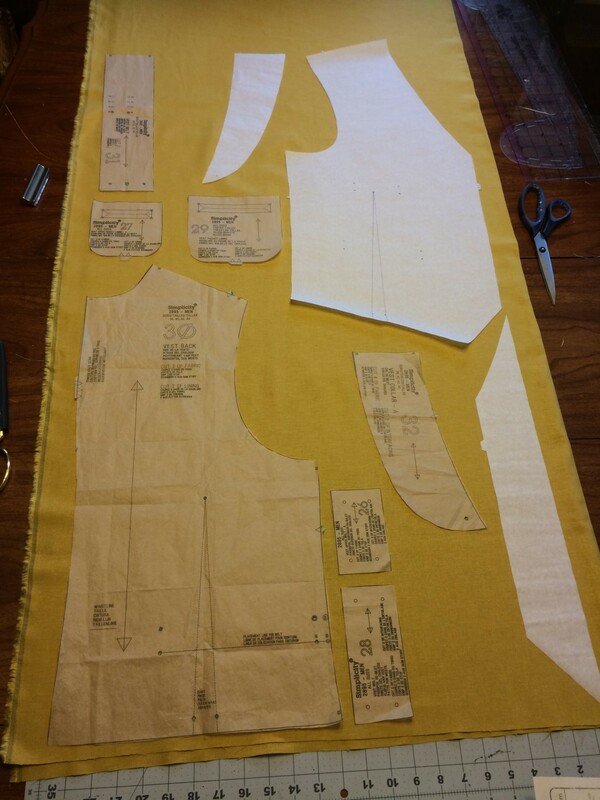 I didn’t take it all the way to completion – just enough to check fit and lines. This helped tremendously, because I could put it on my dummy and draw/tape all over it to figure out what adjustments I still needed to make. 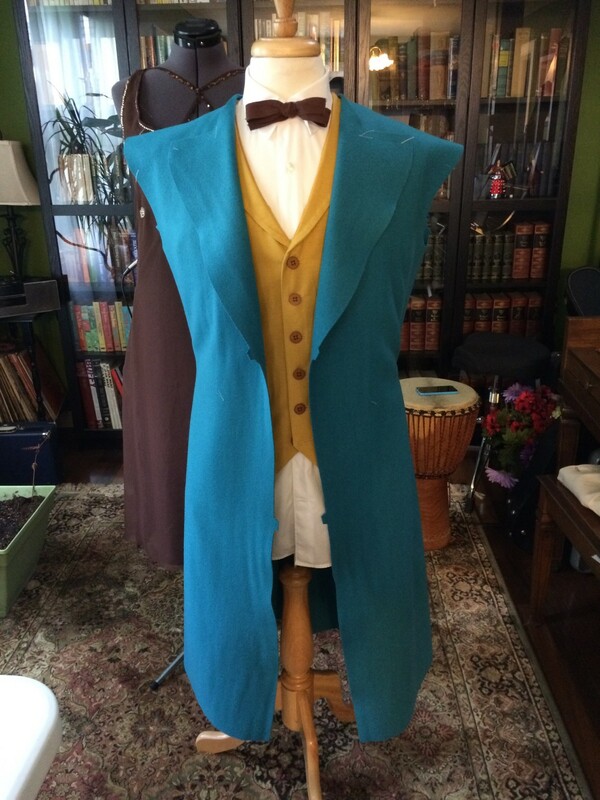 I ended up altering just about every single pattern piece. 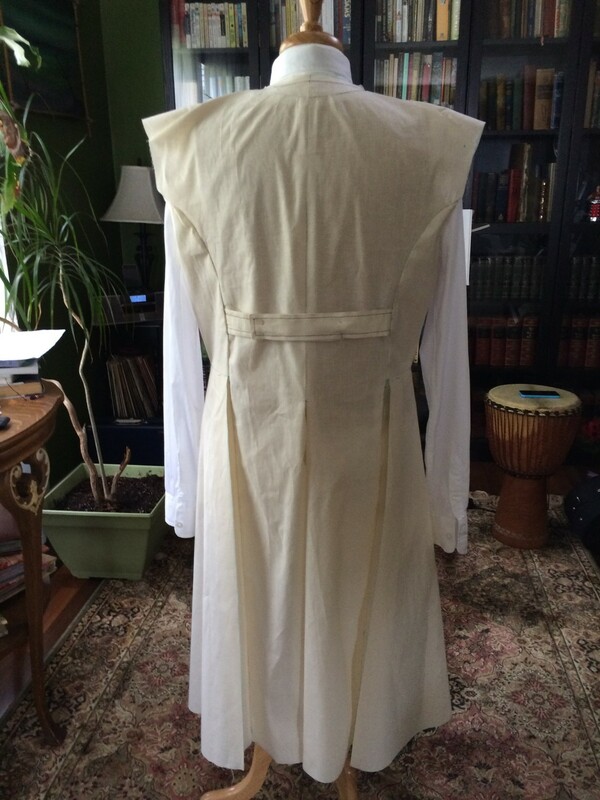 I then sewed a second muslin mockup to make sure I got all the math and shapes right. 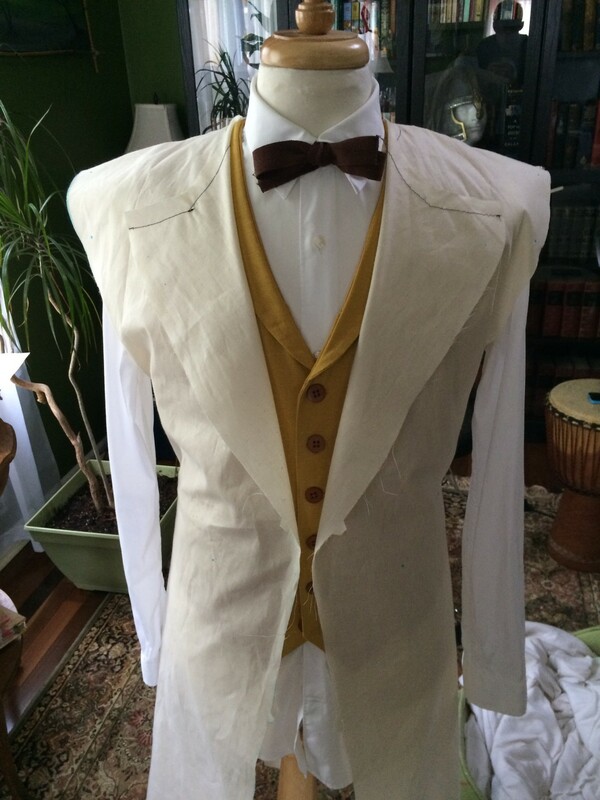 I took this one a little further towards completion, even interfacing the collar and lapels. 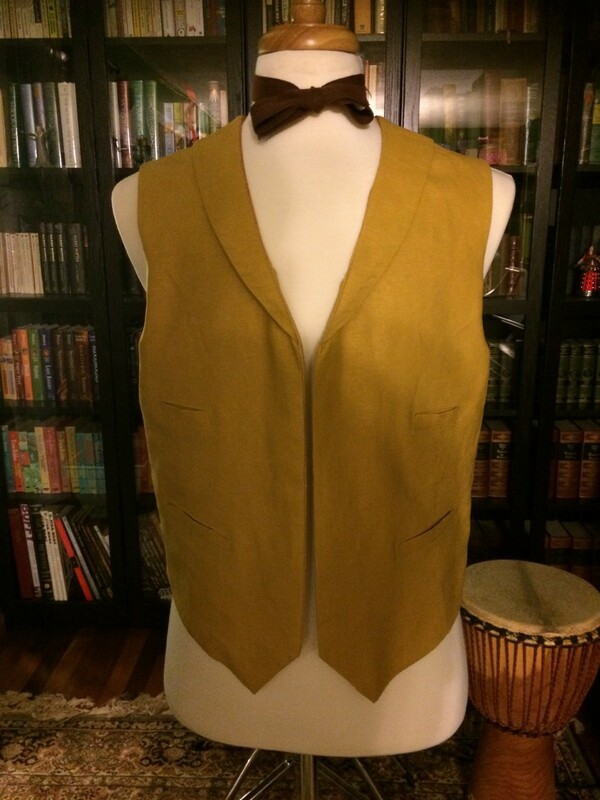 Newt often has his collar flipped up, and his lapels hold their shape very well. 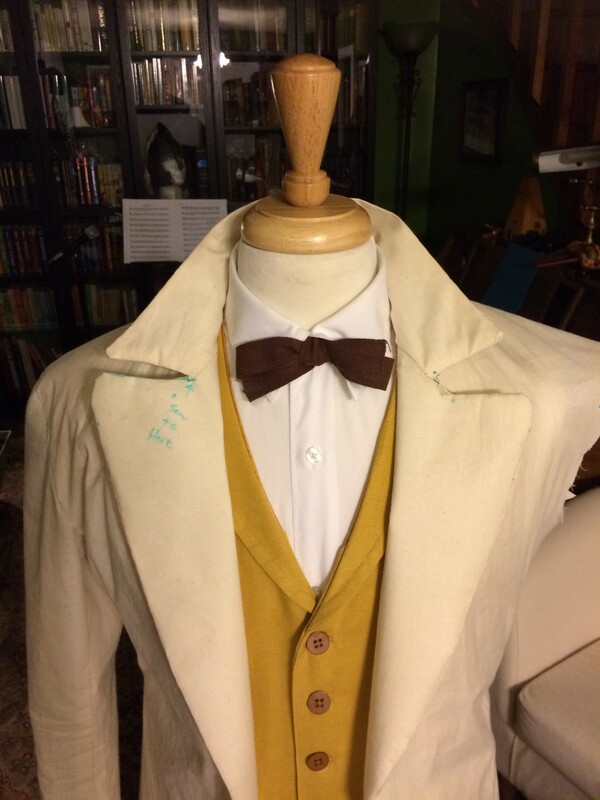 I didn’t trust two layers of wool and some lightweight fusible interfacing to do this without flopping, so I got some heavy fusible interfacing just for the collar and upper facing. I really wanted to try and get hair-canvas and experiment with it, but they don’t carry it at Jo-Ann. Maybe next time. 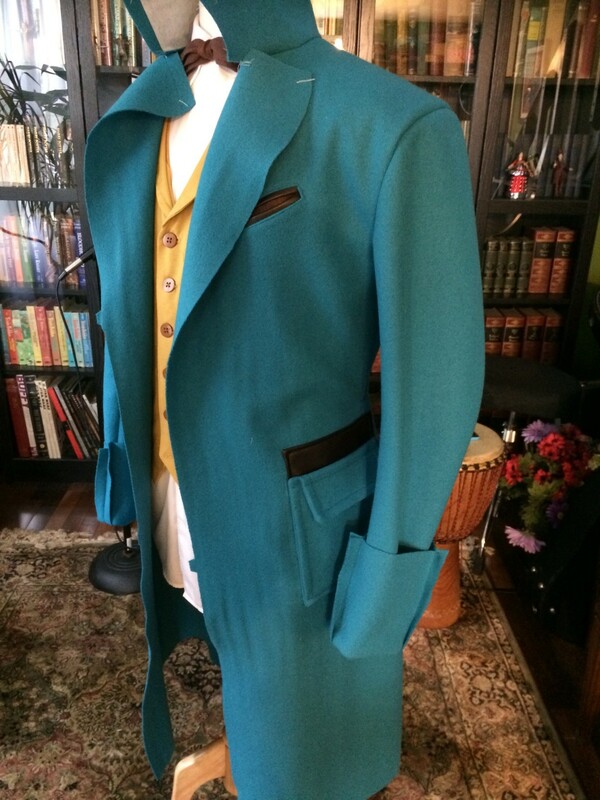 The one piece I couldn’t quite figure out was the accent piece on the under-collar. 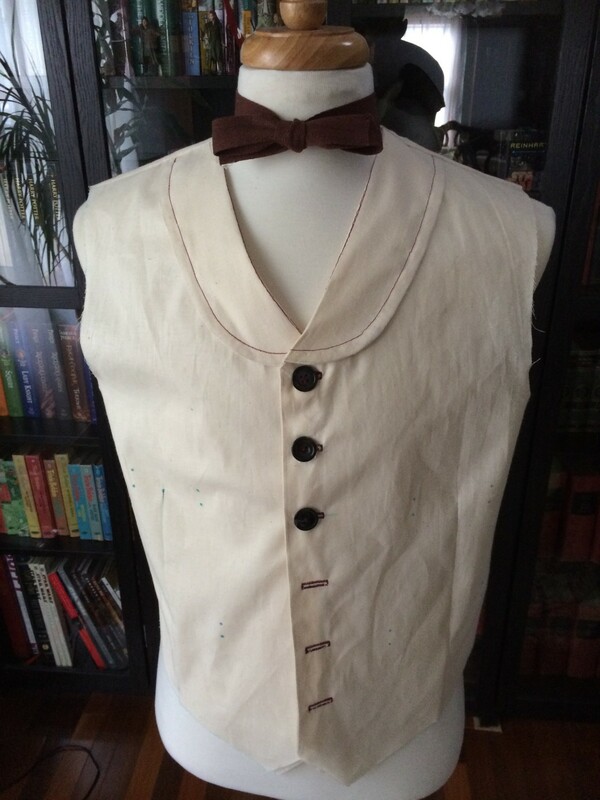 At first I had it as part of the back pieces below the collar, but looking at more photos of the original, you can’t see it at all when the collar is in its normal “down” position. What I suspect is happening is that it’s a narrow football-shaped insert between the upper-back and collar, in order to extend the collar higher. I ended up not including it at all. 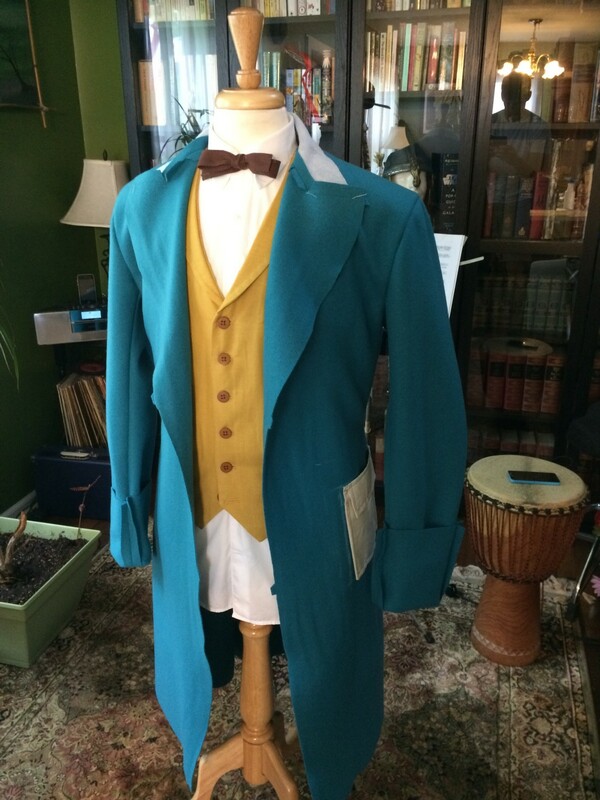 Only other Newt Scamander costumers will notice, probably, but I sacrificed it in the interest of actually getting it done. 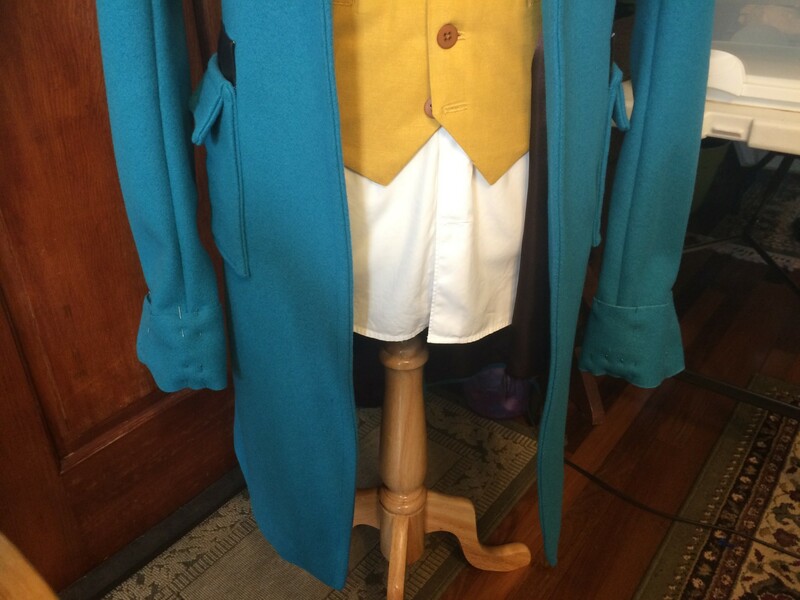 I went back and forth on how to construct the cuffs until I found a new, clearer image of them. 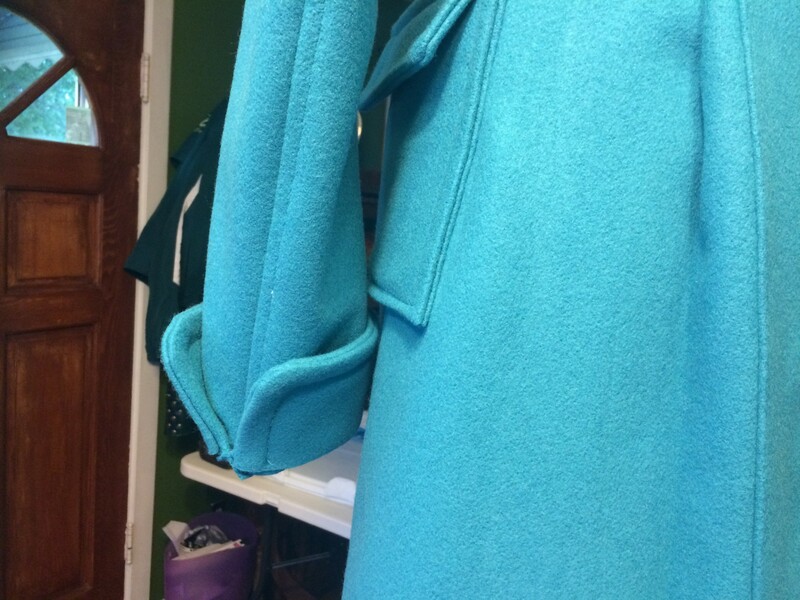 For this reason, before I even knew what I was going to do I extended the sleeves by several inches (6 or so) so that I had some material to work with. 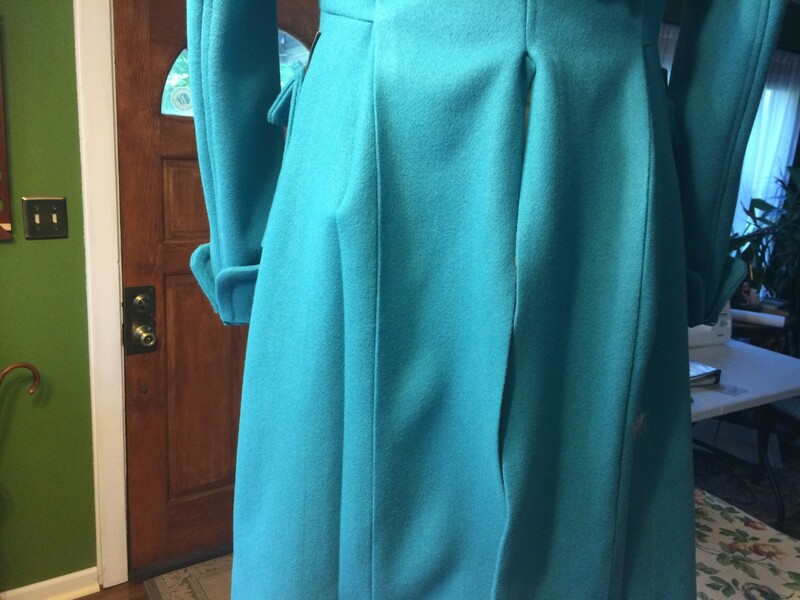 At the time of writing, the best reference photos look like the cuffs are split where the vent would normally be, but I can’t see any evidence of button(s) or buttonhole(s), so that’s how I proceeded (no overlap, no buttons). 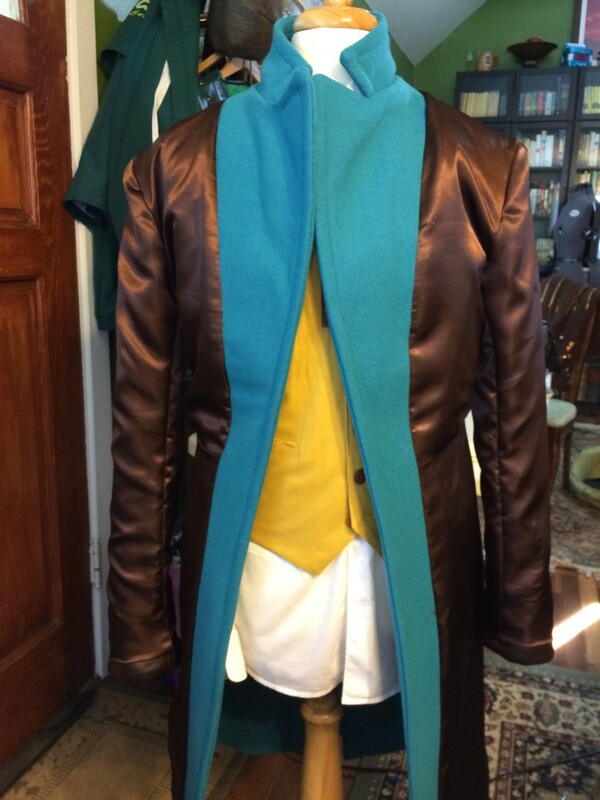 Once the lining was attached at the collar, facings, and hem, I set to work on the cuffs. 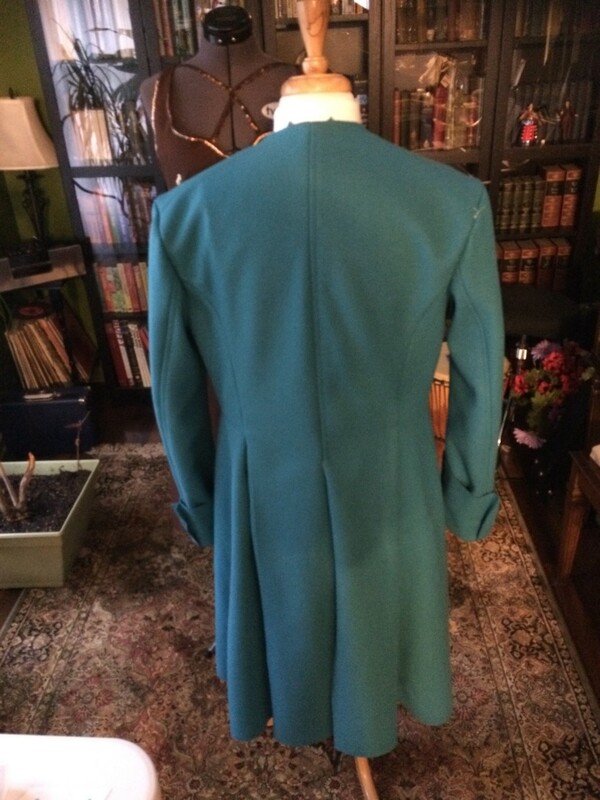 I tried on the coat and turned up the sleeves until they were the correct length, marking a line with white basting thread. 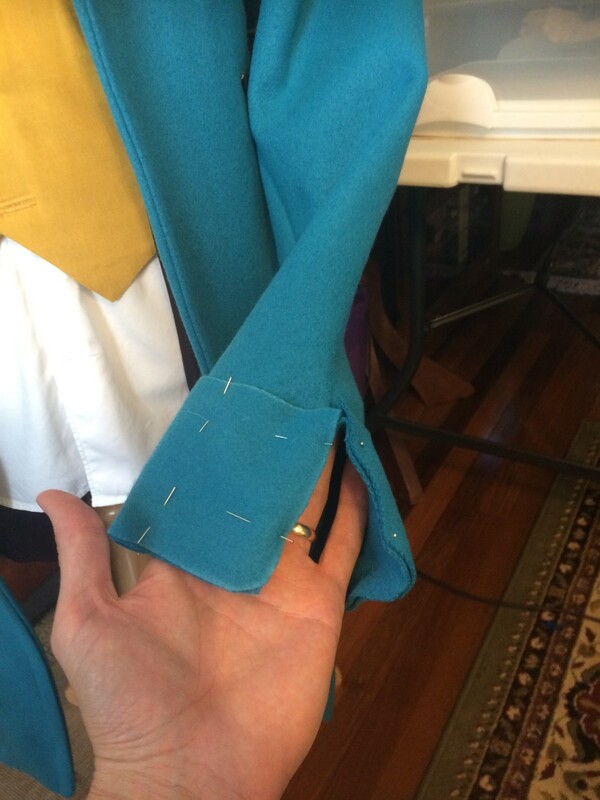 I then ripped the back seam (vent) up to that line, stitched a bar-tack to reinforce it, and clipped the seam allowance at a 90° angle to that point. 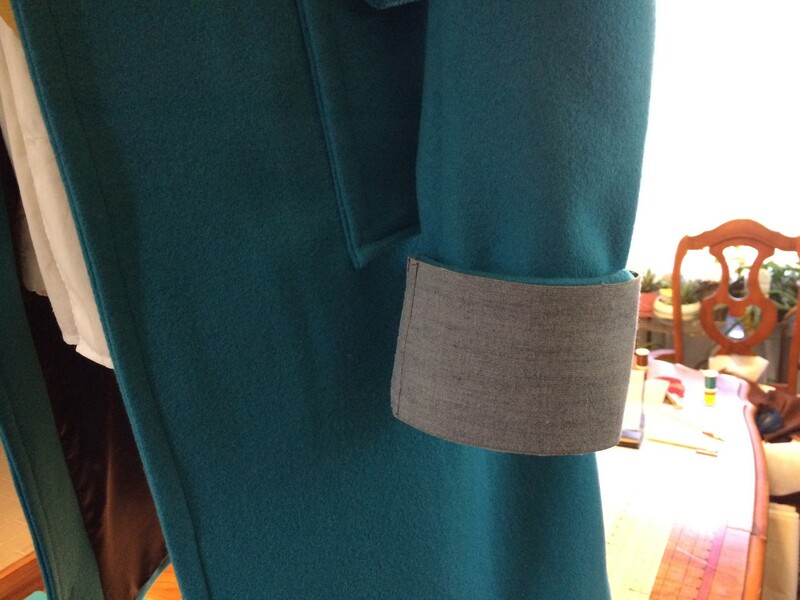 Once I decided how wide the cuffs should be (~3″) I added 1/2″ seam allowance and trimmed the excess. 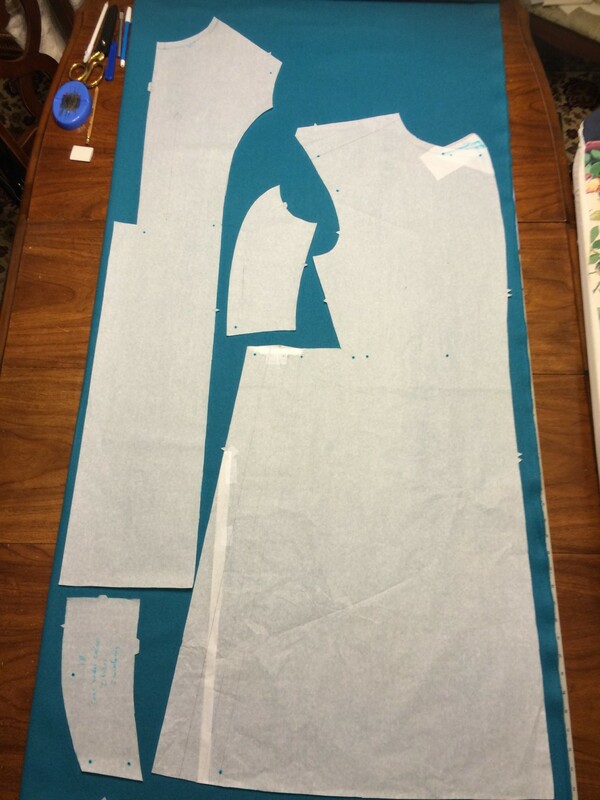 Then I measured the sleeve circumference and cut cuff “facings” to that length plus seam allowances, and 3 1/2″ wide. 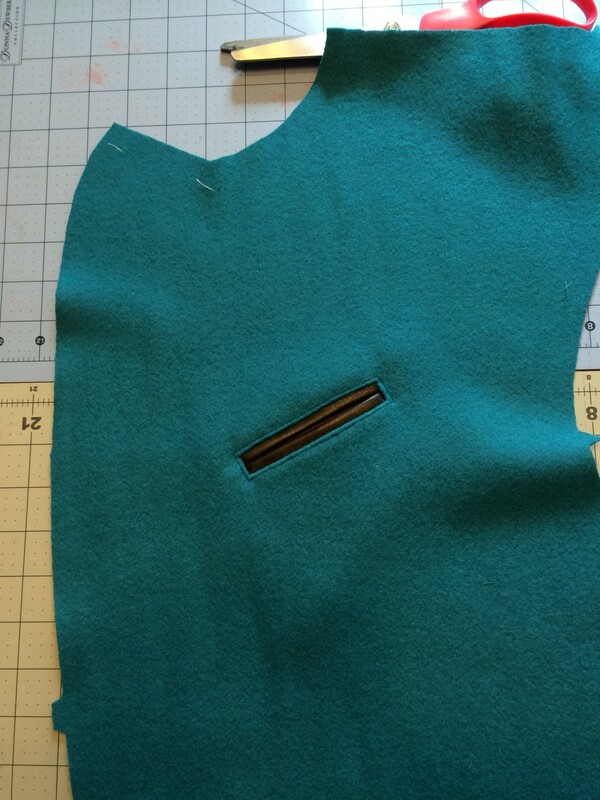 These facings got two of the corners rounded off. 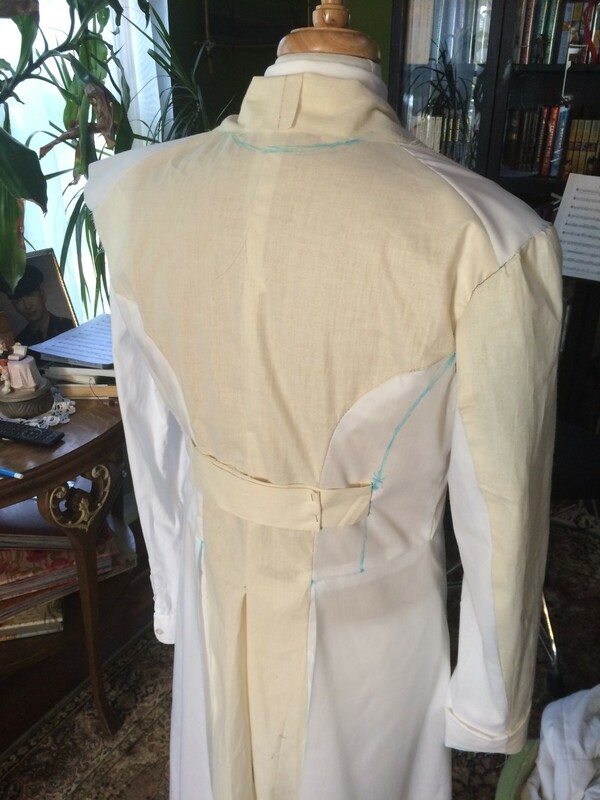 Then I pinned the facings to the outside of the sleeve, right-sides together, and stitched, leaving the “top” long side open. 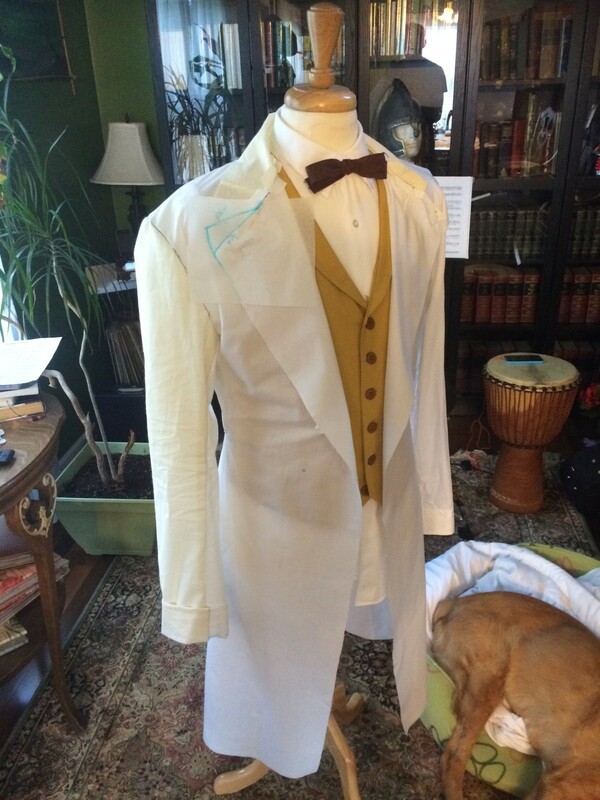 I clipped the curves, and turned the whole assembly inside-out, then top-stitched 1/2″ from the edges and turned the cuffs up the way Newt wears them. 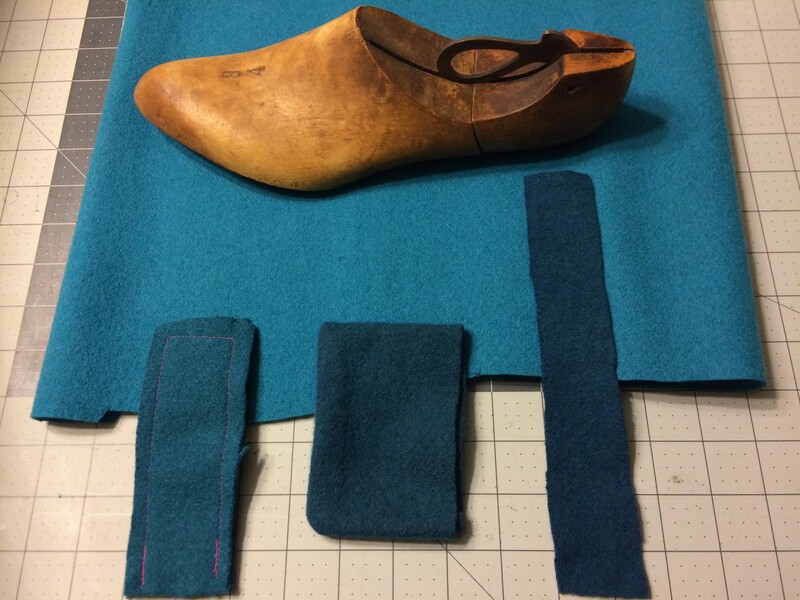 Finally, I stitched a rectangle of faux-leather into a loop, slid it (right-sides together) over the whole turned-up cuff assembly, and stitched through all layers about 1/4″ from the bottom edge. 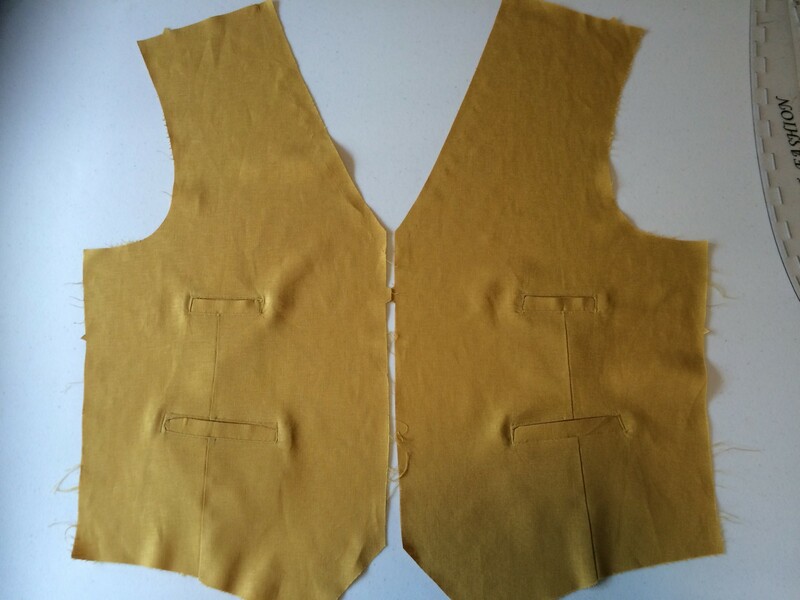 The leather gets turned-up inside and attached to the lining. 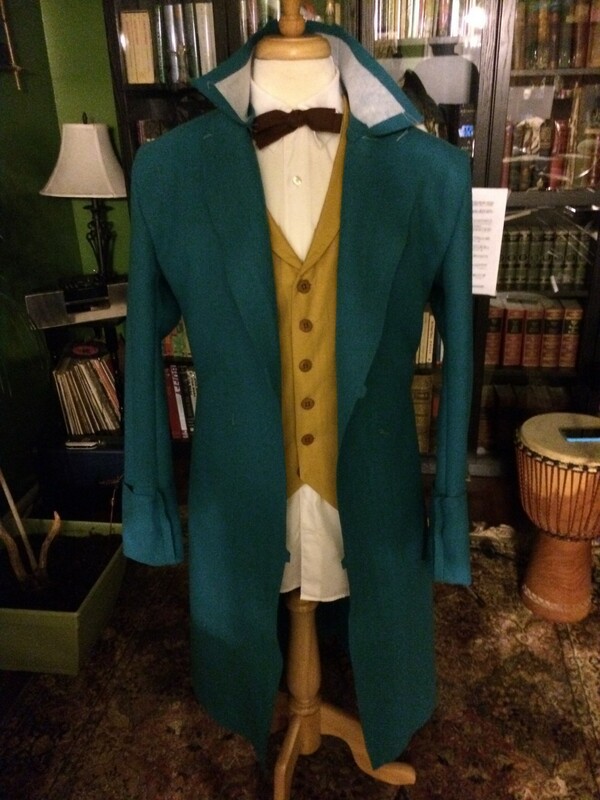 Other components of the costume include Steve Madden “Troopah” boots, a white dress shirt, vintage wool pants with cuff, a vintage tweed jacket, a brown ribbon bow tie, a vintage suitcase acquired from Etsy, a wool scarf knitted by Lynette, a leather pocket-watch strap, and a hand-made wand. 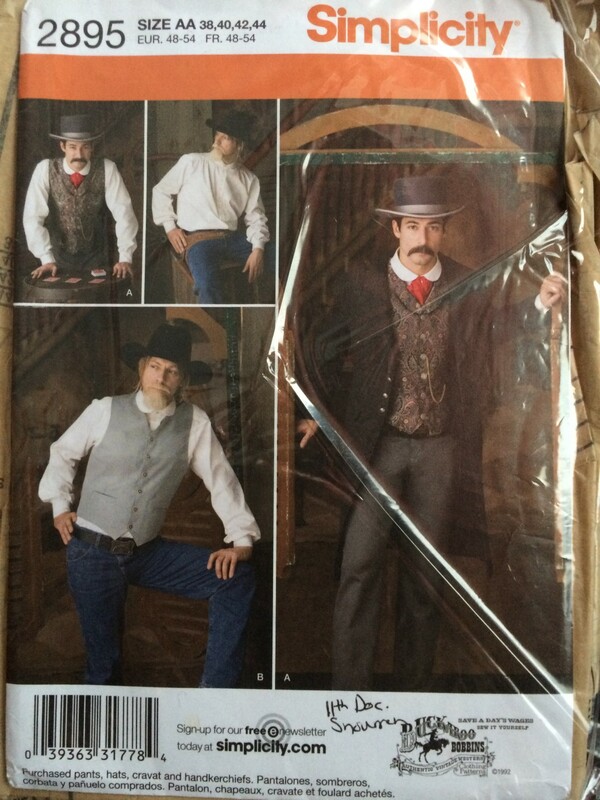 I already owned the shirt, pants, and jacket. 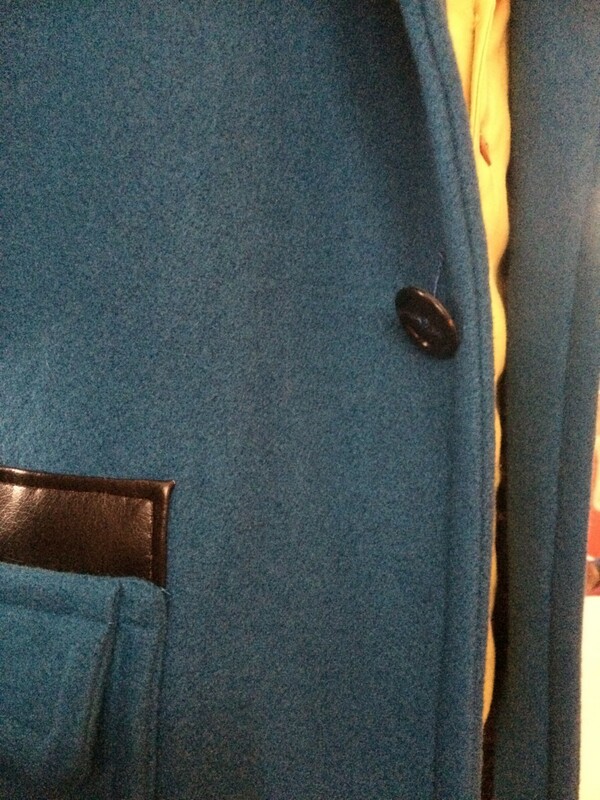 My jacket is inaccurate since it’s only a two-button, but since it barely peeks out from the coat I’m ok with it. 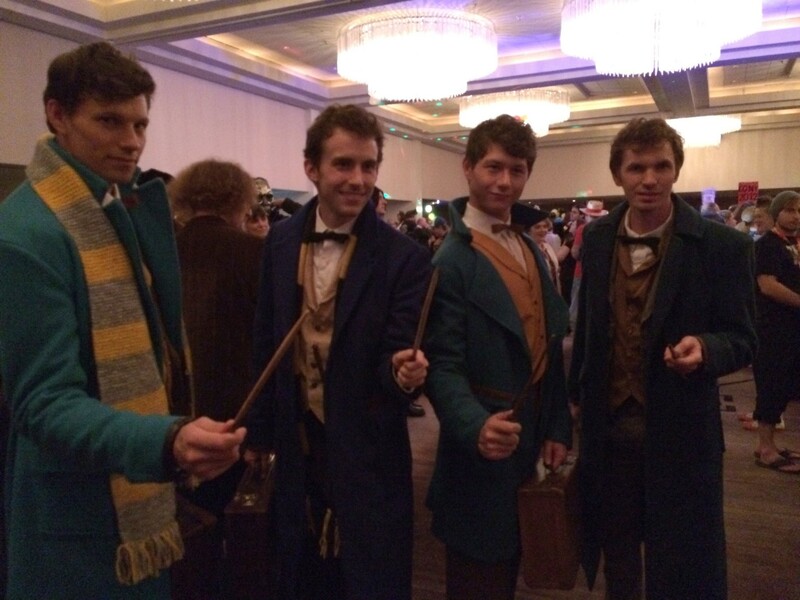 A few weeks before Dragon Con, images from San Diego Comic Con came out showing the replica wand. 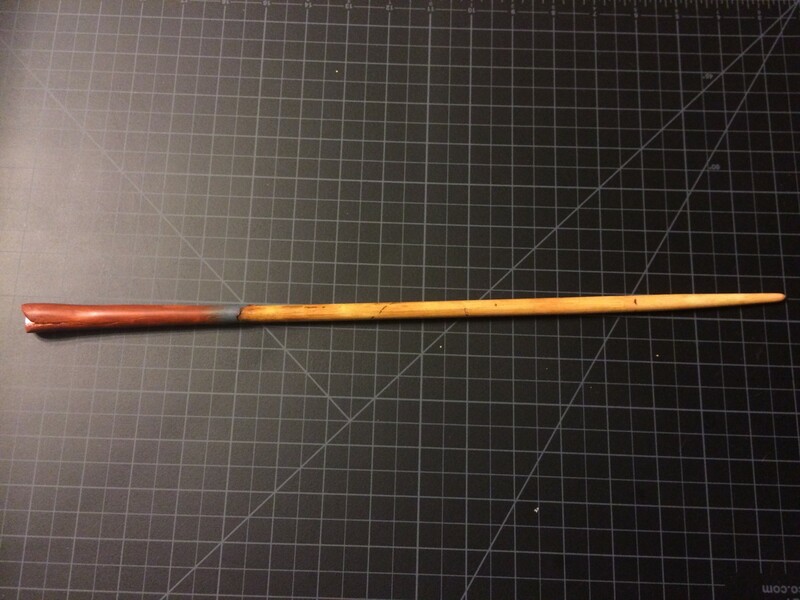 I had already gone to my local Asian market to buy some $2 cooking chopsticks that I planned to modify to make the wand. 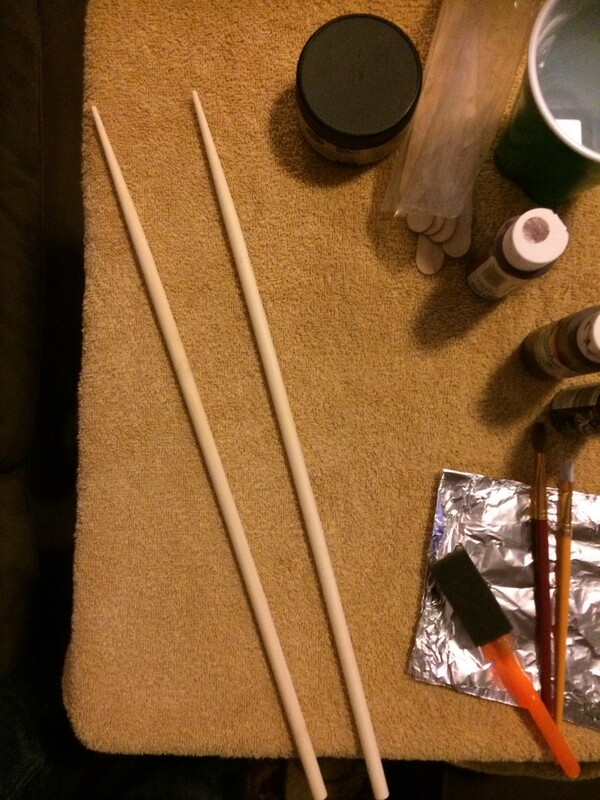 Now that I had good reference, I cut one of them down to size (a bit from both ends, since they taper to too sharp of a point) and sanded the tip round. I used some tools to gouge divots and scratches into the surface, then used Milliput to sculpt the handle. After curing overnight, I painted it with acrylics and sealed with a satin clear coat. 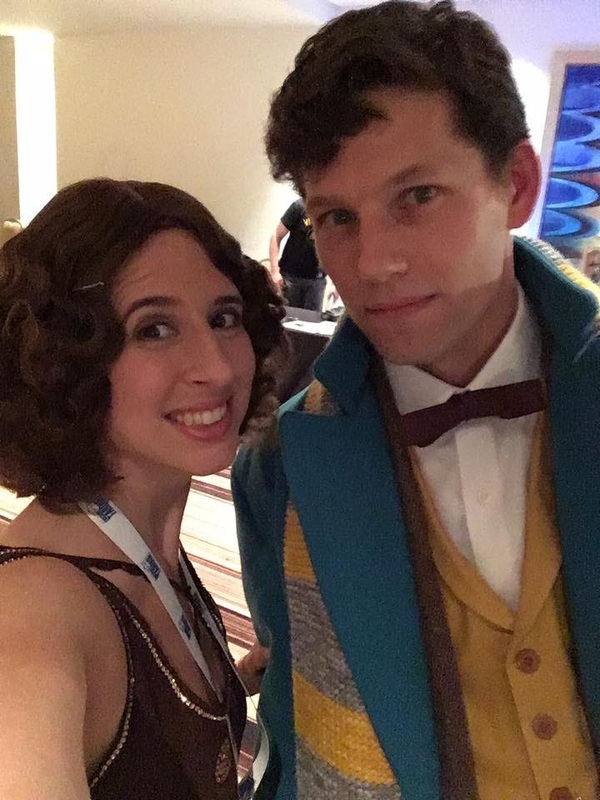 I debuted the costume at Dragon Con 2016, both on Saturday evening and again on Sunday evening for the Yule Ball. On Sunday I was joined by Lynette in her Porpentina costume. 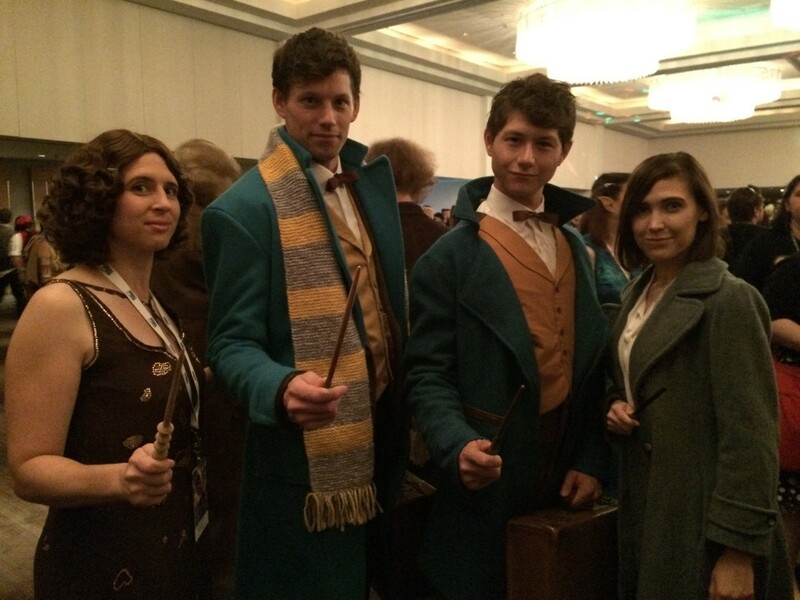 This was probably my favorite event of the con, and our costumes got a great reaction. 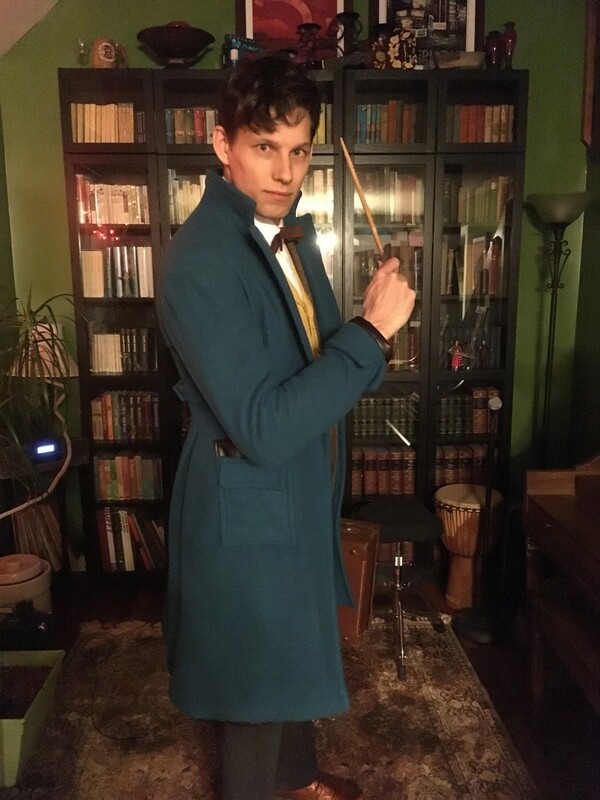 We encountered several other couples doing Fantastic Beast costumes, and we were able to geek out together over the frustrating details of this outfit. 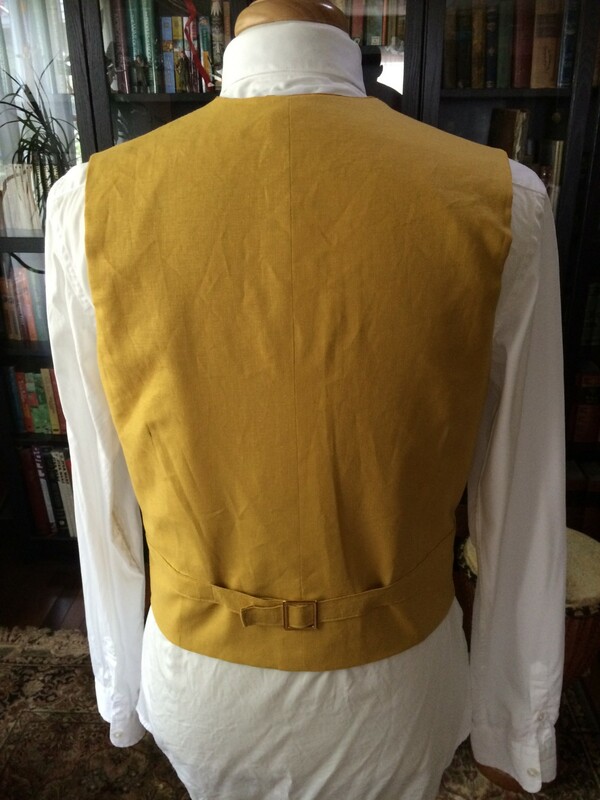 Only one of the three other Newts actually included the under-collar detail, so I don’t feel bad about leaving it out. 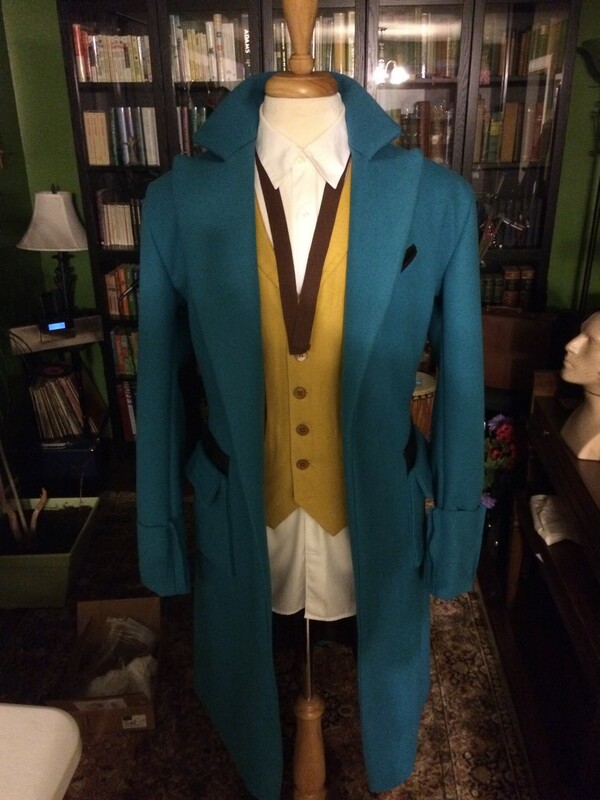 Overall I am VERY pleased with how this coat came out. It’s not perfect, but it’s damn close. 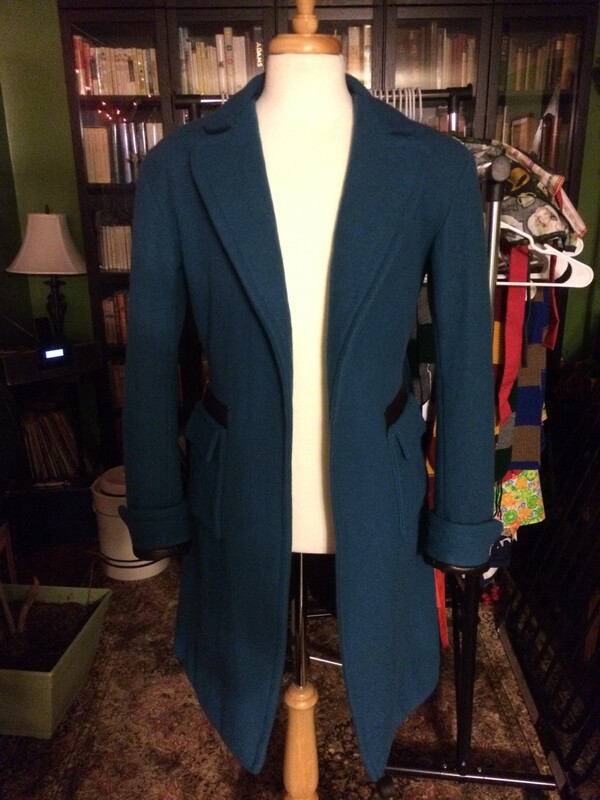 I dyed the coat! 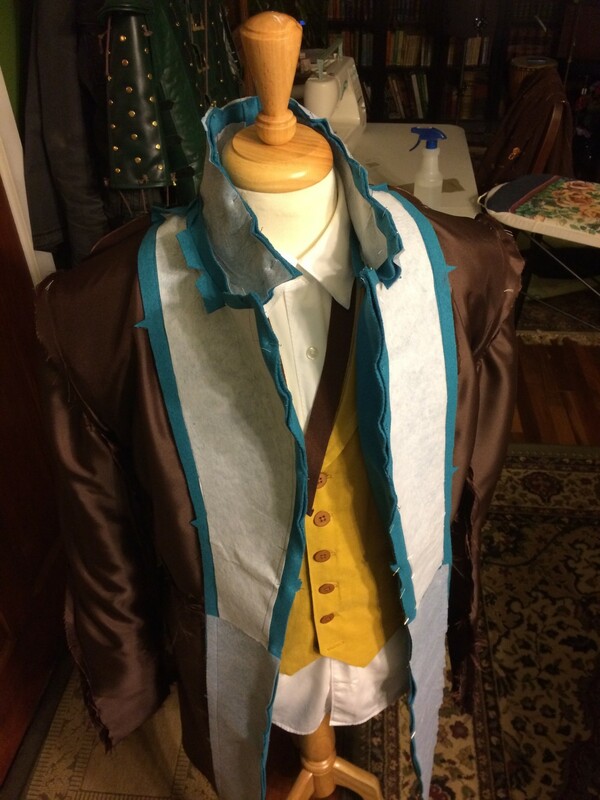 The original fabric was bothering me, since it was clear now that it was too light and bright. 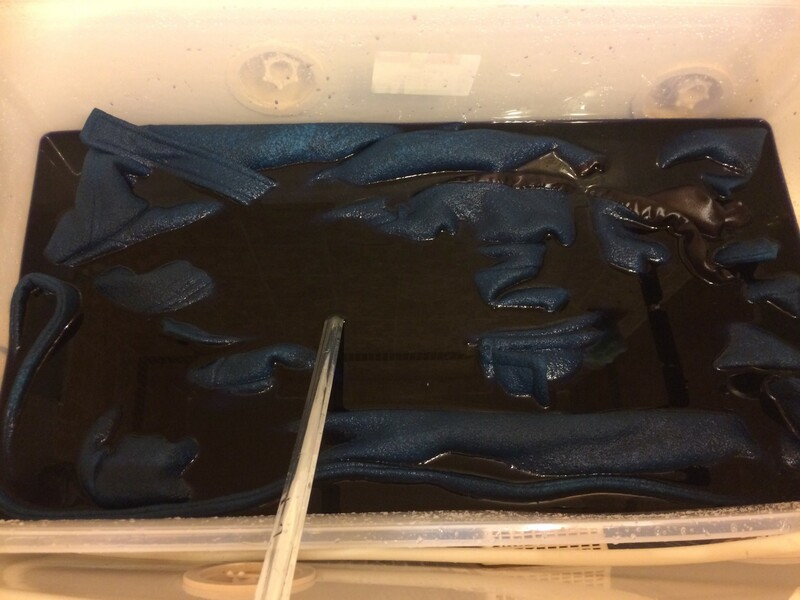 After a few tests with lukewarm water (to avoid shrinkage as much as possible), I settled on Rit “denim” blue, and proceeded to dye the coat in a big plastic tub inside of my bathtub. I ended up with more shrinkage than I would have liked, but I’m happy enough with the color that it’s ok. I also upgraded the buttons to be more accurate after seeing photos from NYCC. This build is absolutely amazing. 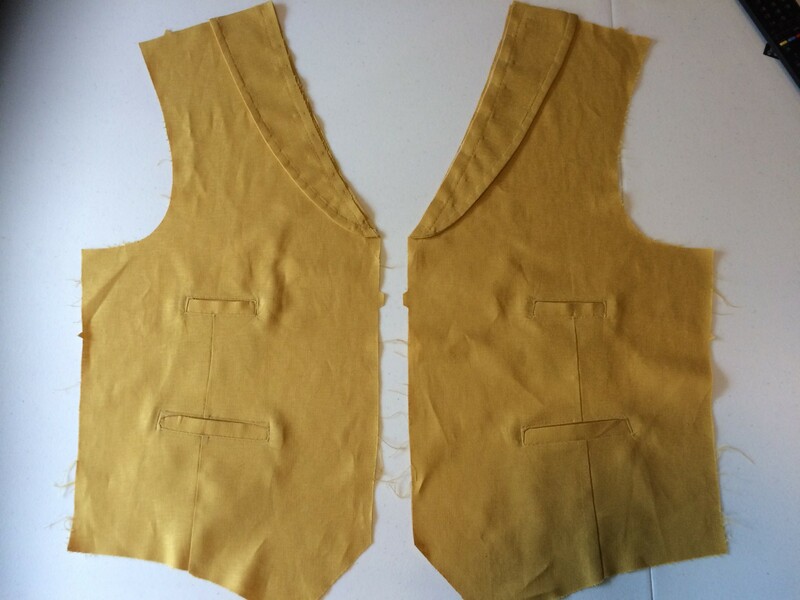 I’m actually about to make my own Newt coat using the exact same pattern, AND the exact same fabric from the same sellers. 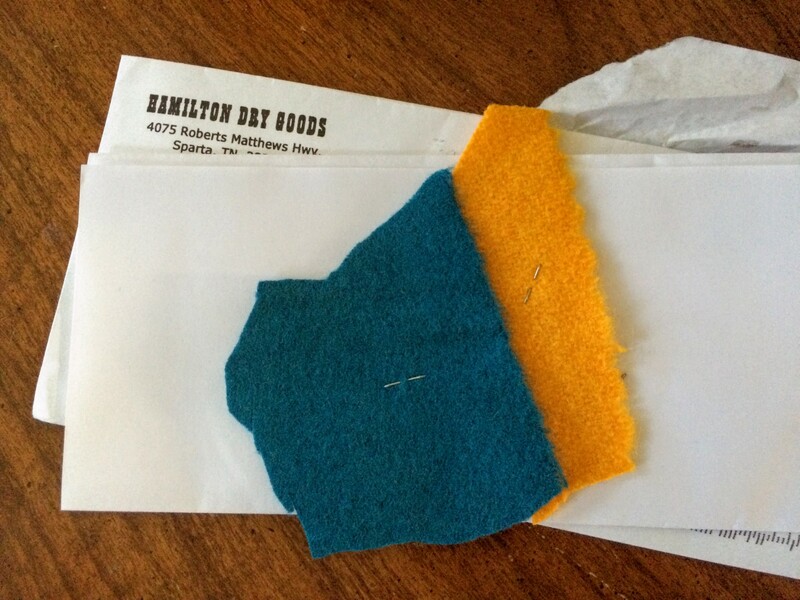 I requested a swatch from them and also felt like it was too light (but I felt like it was the closest I was going to get) , and I decided that once my fabric comes in, I’m going to try to dye it. 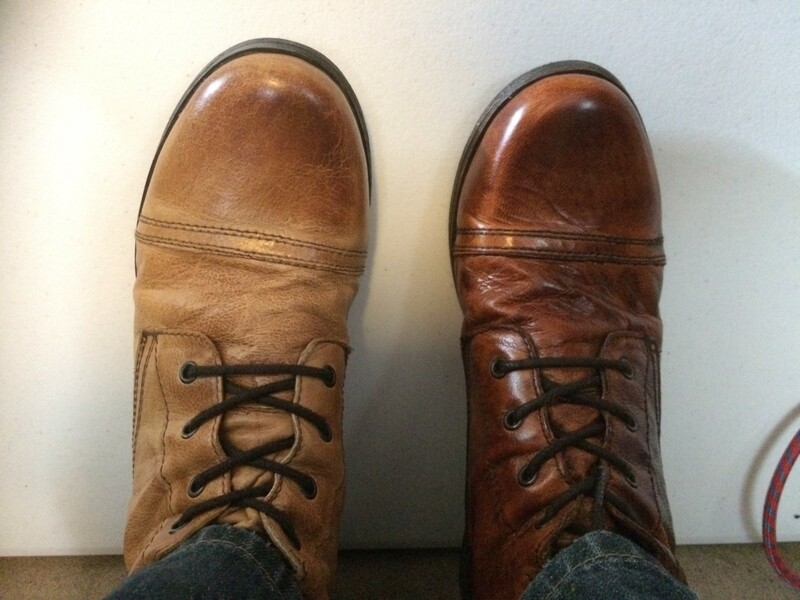 Do you have any tips for the dying process like the amount of dye, or any other tips? 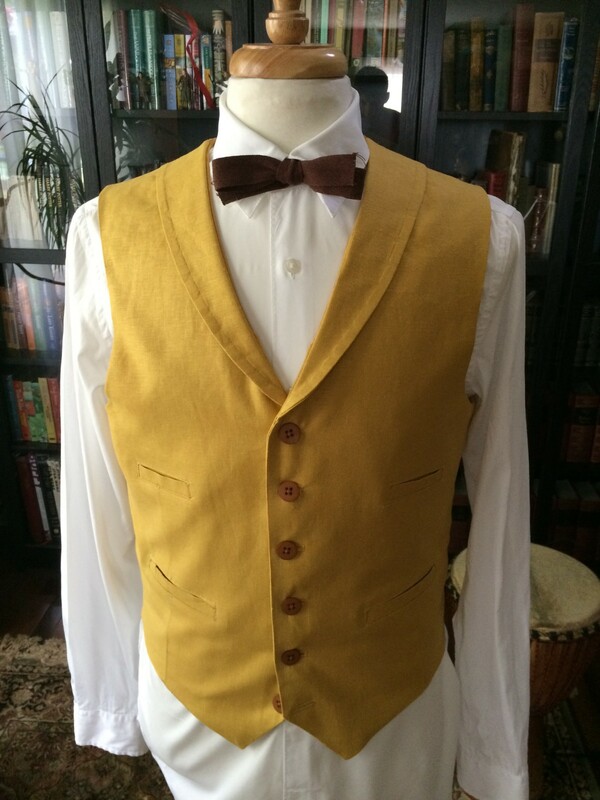 I’ve never dyed any fabric before but I hear sometimes people add salt or vinegar depending on what kind of fabric they’re dying. Did you do anything like that? Thanks for any help you may be able to send my way! Yes! I would absolutely try to follow the instructions on whatever dye you end up using. 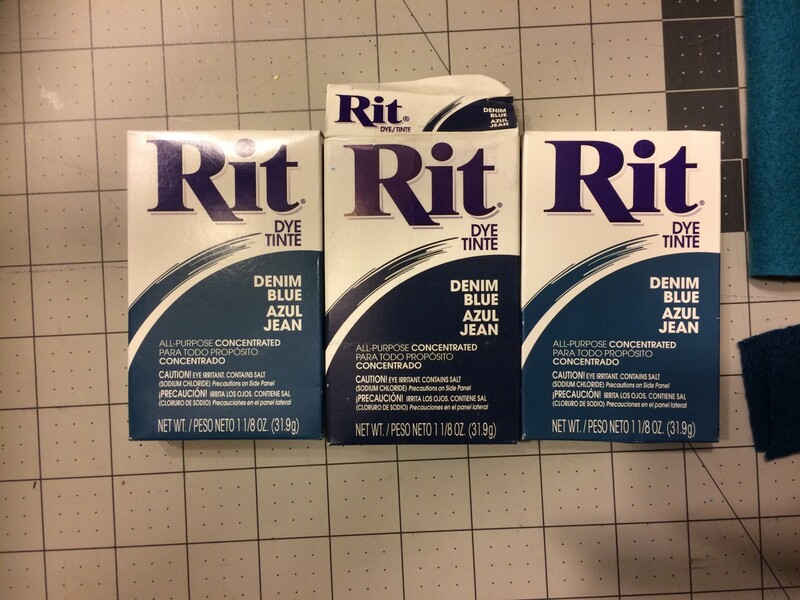 I used RIT “denim” color in a powder, but your fabric could be slightly different so you should do tests to see if that’s going to work for you. 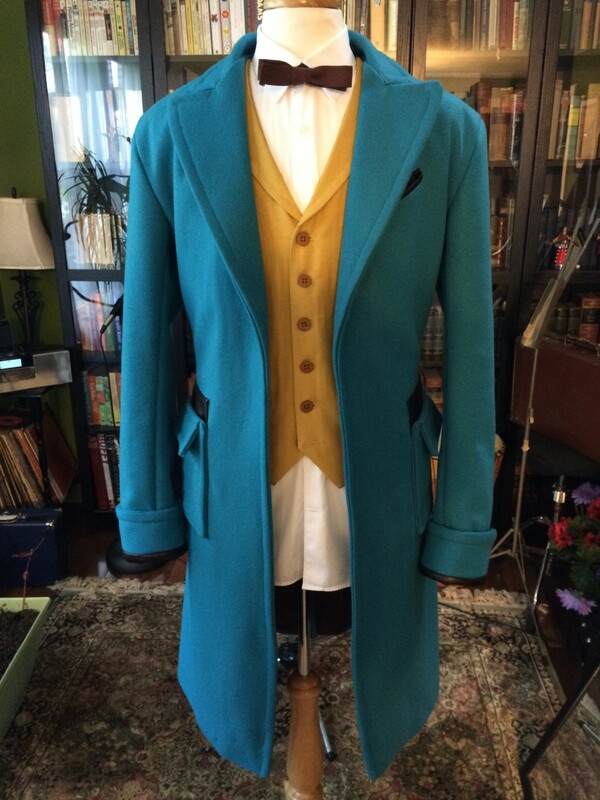 Better to spend the $5 or so on an extra packet of dye than to end up with a coat you’re not 100% happy with. For the RIT, I was adding vinegar to the mix (per instructions), and the only thing I did different was use cooler (~90F) water to try and avoid shrinkage. The way I dried mine was to hang it in the shower and aim a box fan into the bathroom for a couple days. Whatever you end up doing, don’t rush it. I’m no expert on wool, but my understanding is that extreme temp changes will “shock” the fibers leading to shrinking or felting. 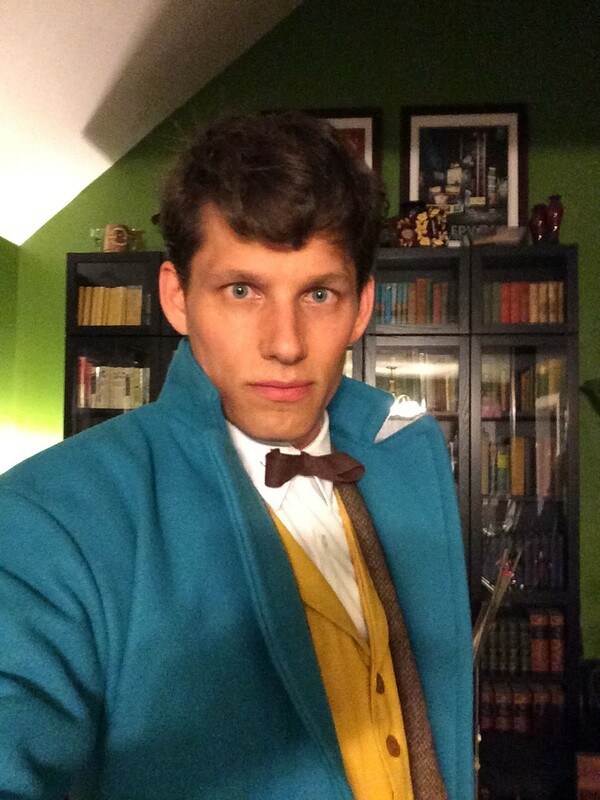 You did an INCREDIBLE job on this cosplay! 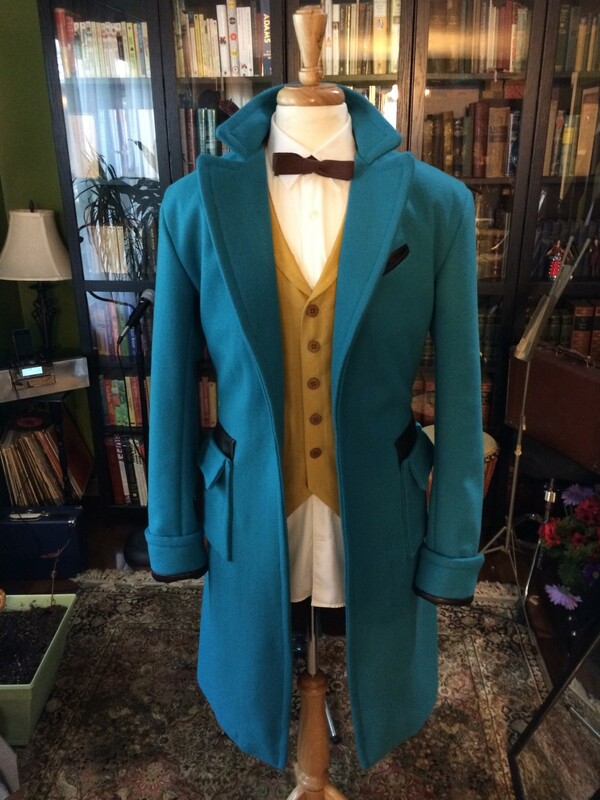 Are you also going to make the tweed coat from the new movie? Thank You! 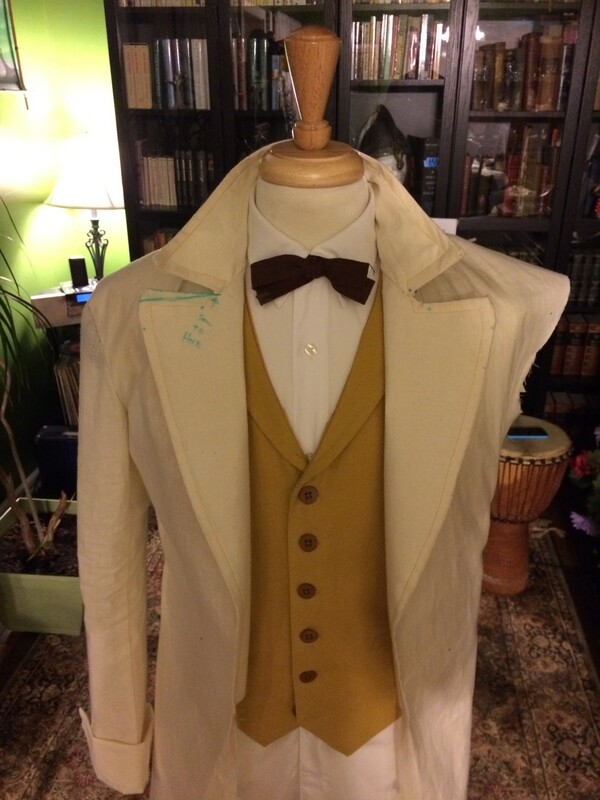 Yes, I have a few things in the works, including a new version of this original coat, a new more accurate waistcoat, upgraded boots, new trousers, new tie, and eventually a full Crimes of Grindelwald ensemble. 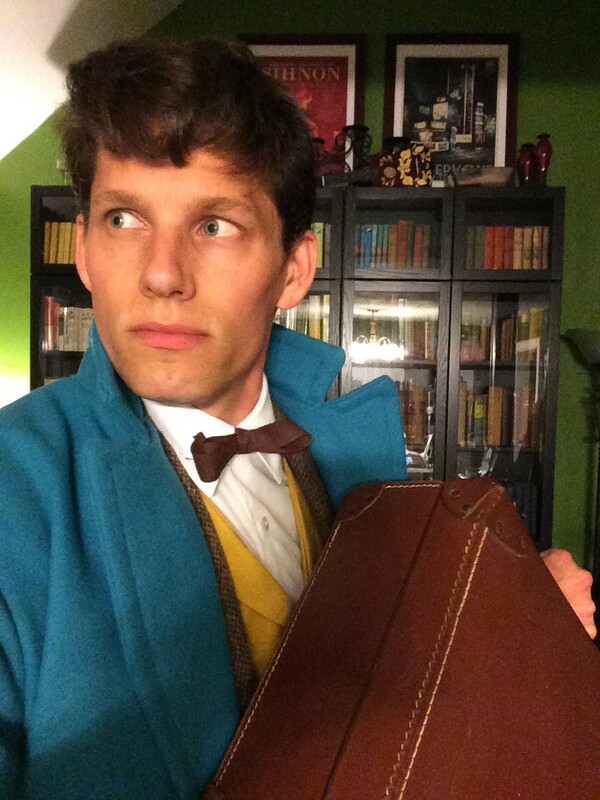 If you are on Facebook and have more than a passing interest in this costume, please join our Newt Scamander Cosplay community. I’ll update more frequently over there.